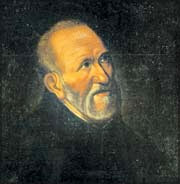 AFTER a holy youth, Lancelot Avellino was ordained priest at Naples. At the age of thirty-six he entered the Theatine Order, and took the name of Andrew, to show his love for the cross. For fifty years he was afflicted with a most painful rupture; yet he would never use a carriage. Once when he was carrying the Viaticum, and a storm had extinguished the lamps, a heavenly light encircled him, guided his steps, and sheltered him from the rain. But as a rule, his sufferings were unrelieved by God or man. On the last day of his life, St. Andrew rose to say Mass. He was in his eighty-ninth year, and so weak that he could scarcely reach the altar. He began the "Judica," and fell forward in a fit of apoplexy. Laid on a straw mattress, his whole frame was convulsed in agony, while the fiend in visible form advanced to seize his soul, Then, as his brethren prayed and wept, the voice of Mary was heard, bidding the Saint's guardian angel send the tempter back to hell. A calm and holy smile settled on the features of the dying Saint, as, with a grateful salutation to the image of Mary, he breathed forth his soul to God. His death happened on the 10th of November, 1608. Reflection.--St. Andrew, who suffered so terrible an agony, is the special patron against sudden death. Ask him to be with you in your last hour, and to bring Jesus and Mary to your aid.